Chicago rappers Saba (center) and Mick Jenkins (right) discuss their brand of socially-conscious hip-hop with African American Studies Prof. Nitasha Sharma. Two Chicago rappers answered questions about their brand of socially conscious hip-hop and broader issues of race and violence during a Q&A on Tuesday. 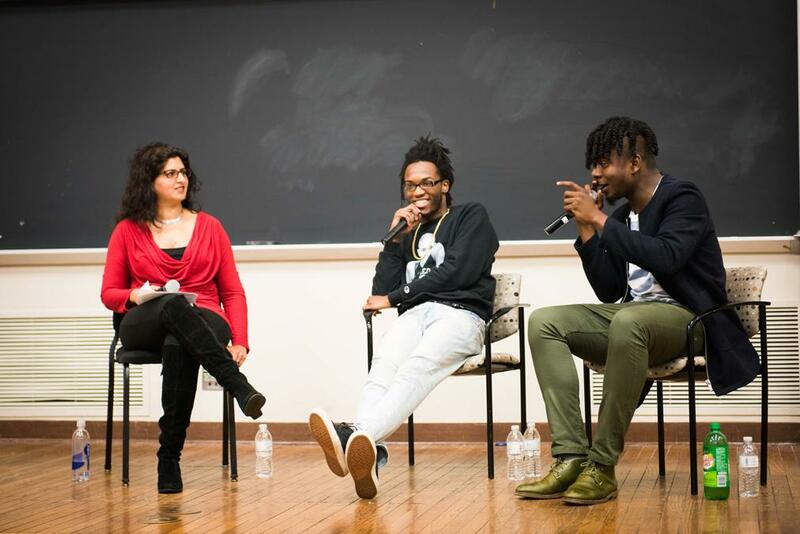 Mick Jenkins and Saba answered questions from students at an event in Fisk Hall sponsored by Northwestern Community Development Corps, For Members Only and the Contemporary Thought Speaker Series moderated by African American Studies Prof. Nitasha Sharma. More than 150 students attended. The rappers discussed the term “Chiraq” and the extent to which rappers fetishize violence in the city. Jenkins said during high school he’d sometimes hear about friends of friends being killed, mostly in gang-related incidents. This past weekend, Sharma noted, 56 people were shot in the city. Saba said that hip-hop, like most art, reflects its creators and their life experiences. The rappers reflected on how they’re responding to incidents of police brutality that have reignited discussions of race relations nationwide. Despite the media’s newfound interest in the topic, Jenkins said these sort of events have been going on for a long time. Both Jenkins and Saba said they often have an easier time writing more socially-conscious verses because the content matter is so familiar to them. Much of the discussion focused on money in the music industry, specifically how the rappers balance staying true to socially-conscious hip-hop and maintaining mainstream appeal. Jenkins noted that although artists like Trinidad James, of “All Gold Everything” fame, can break through with one smash hit, for more politically-driven rappers, like himself, it takes longer. “Why is it that J. Cole and Kendrick Lamar and Big K.R.I.T. and myself and Saba, why do we need to have three or four or five mixtapes before n—–s take notice?” he said. Sharma asked if white people who attend the rappers’ shows should say the N-word when singing along. Weinberg sophomore Ben Levey, an NCDC member who helped organize the event, told The Daily voices like Jenkin’s and Saba’s aren’t often heard on campus. He said he hopes the event will prompt students will think more critically about Chicago and its hip-hop scene.